Aegina - Αίγινα, lying some 17 nm south-west of Piraeus, is a hilly and fertile island of Tertiary limestones and schists, with isolated rounded hills of volcanic origin. For the most part the coast falls steeply down to the sea, with few sheltered bays. The main occupation of the inhabitants is farming, in particular the growing and export of the island's excellent pistachio nuts. Fishing, sponge-diving and pottery manufacture are also of some economic importance. Aegina is noted for the production of its water-coolers (kannatia) - two-handled wide-necked jars in a porous fabric which keep their contents cool by evaporation. With its mild climate and low rainfall, Aegina has long been favoured as a summer resort by the prosperous citizens of Athens. In recent years it has become increasingly popular with foreign visitors. The legendary ancestor of the Aeginetans was Aiakos, son of Zeus and Egina and father of Peleus and Telamon, who was celebrated for his wise and just rule and became judge in the Underworld together with Minos and Rhadamanthys. The earliest traces of Pelasgian settlement on the island date from the 3rd millennium BCE. In the 2nd millennium Aegina was already an important trading-station, dealing in pottery and ointments, as finds of Helladic, Cycladic and Minoan material have shown. It is first recorded in history as a colony of the Dorian city of Epidavros, and together with Epidavros was ruled in the 7th c. BCE by Phaidon of Argos. After shaking off the control of the its mother city in the 6th c BCE. 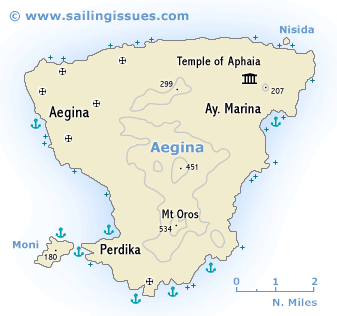 Aegina enjoyed a period of some prosperity, which soon brought it into competition with Corinth. The Aeginetans had trading posts in Umbria, on the Black Sea and in Egypt, and their ship owners were the wealthiest in the Ancient World. Aeginetan coins bearing the effigy of a tortoise are the oldest known, and by 656 BCE already had a wide circulation, and Aeginetan weights and measures remained current into Roman times. At the beginning of the Persian Wars this seafaring State was at the height of its power. After the Battle of Salamis, in which 30 vessels of Aegina took part, an Aeginetan ship was awarded the prize for the highest valour. But Aegina was also led by its commercial interests to offer Darius' envoys earth and water in token of submission, whereupon, on the motion of Athens, it was called to account by Sparta. This was the occasion of further conflicts with Athens, which saw the strong neighbouring island as an obstacle to the expansion of its sea-power. After naval victories at Angistri and off Aegina itself the Athenians - though simultaneously fighting with Megara and in Egypt - forced Aegina to submit after a nine-month-long siege, and in 456 BCE the city was compelled to pull down its walls, surrender its warships and pay tribute to Athens. At the beginning of the Peloponnesian War (431 BCE) the Aeginetans were expelled from their island and the land distributed to citizens of Attica. After the final defeat of Athens in 404 BCE many of them returned, but the island's great days were over. Athens rapidly recovered and after a series of military campaigns regained control of Aegina, which thereafter shared the fortunes of the Athenian State. From 12 January to 3 October 1828 Aegina was capital of Greece. 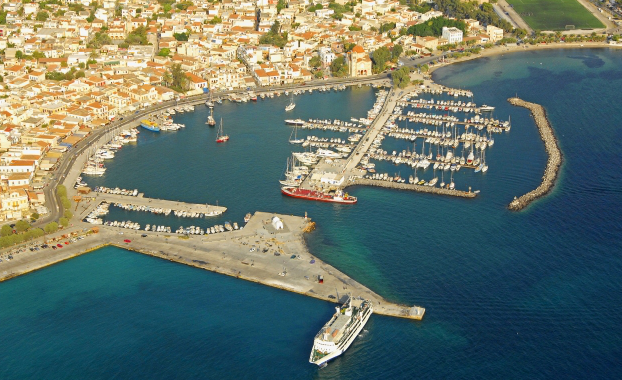 ↑ Aerial photo of Aegina Perdika port. 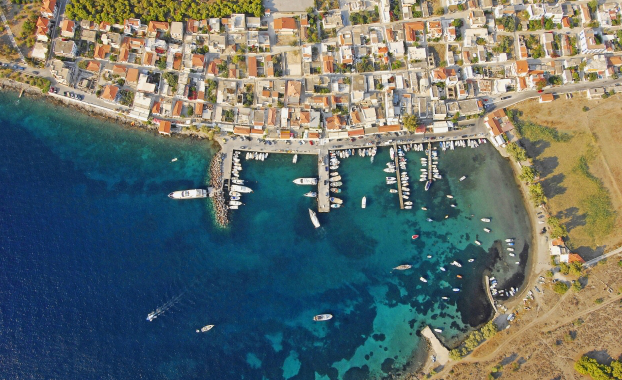 ↑ Aegina marina - aerial photo looking east. The chief place on the island, Aegina (pop. 5000), lies on gently rising ground on a wide bay at the north end of the west coast. 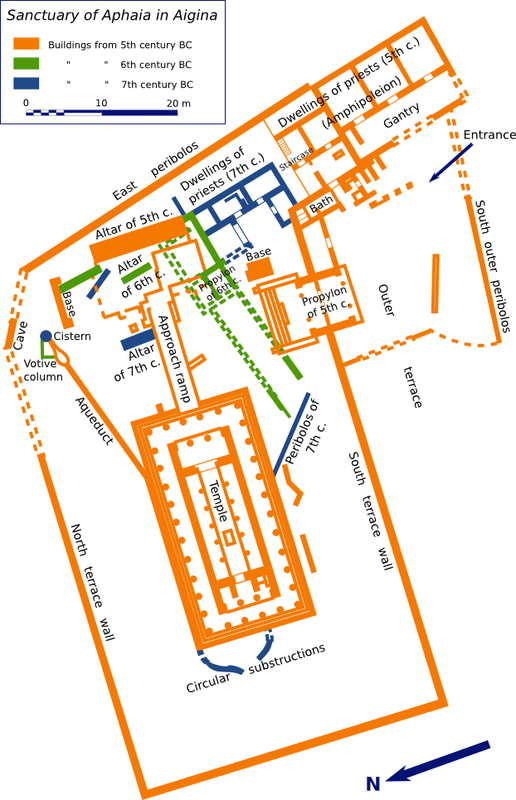 It occupies the site of the ancient city, Egina, which was larger than the present town. From the harbour, sheltered by a breakwater, there are fine views of the smaller islands of Metopi and Angistri to the south-west and Moni to the south and of the hills round Epidavros. The Archaeological Museum contains material from the temples of Aphaia and Aphrodite, together with pottery and other grave-goods ranging in date from the 3rd millennium BCE to Roman times. On the hill of Kolona, to the north of the town, is an 8 m high Doric column. According to Pausanias this belonged to the temple of Aphrodite by the harbour (460 BCE): in fact the temple was dedicated to Apollo. Under the temple were found remains of Mycenaean and pre-Mycenaean settlement (3rd millennium BCE). To the west were two smaller temples, probably dedicated to Artemis and Dionysos. A sphinx (circa 460 BCE) which was discovered here in 1904 is now in the Archaeological Museum. Below the temple, to the south, was the ancient commercial harbour, now silted up. When the sea is calm the old quays can still be seen under water. 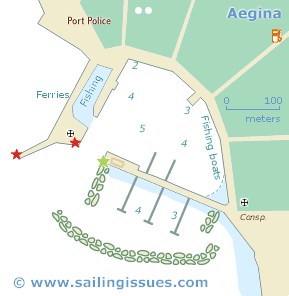 The modern harbour, on the site of the ancient naval harbour, is still protected by the ancient moles which have been maintained in good condition. On the north mole, the longer of the two, is and early 19th c. chapel dedicated to St Nicholas.